Published by Joshua Clare-Flagg on 14 Oct, 2016. 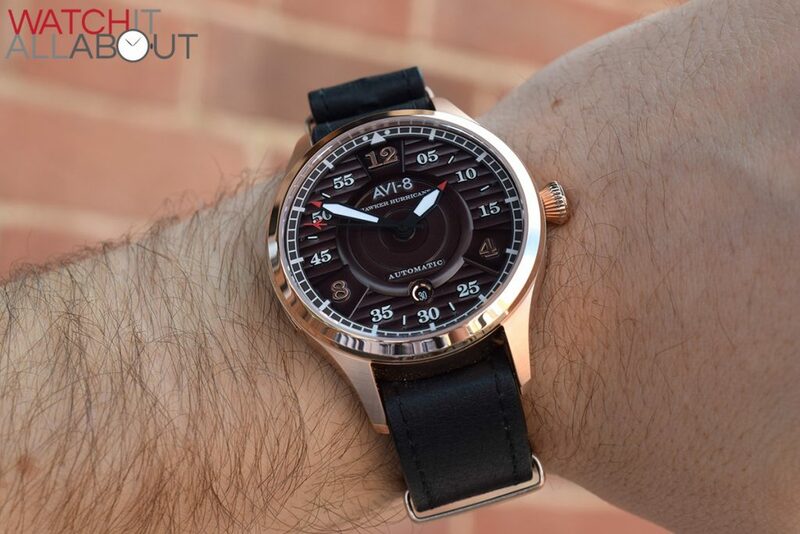 I’ve reviewed a number of Avi-8’s here, and all have been well designed but not quite finished up to the standard of the RRP. Thankfully, a lot of the time you can get them elsewhere for less. That being said, the new Hawker Hurricane Battle of Britain does not follow that trend. 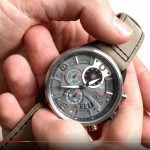 This is a watch that justifies the price tag, with a number of features that really impressed me. 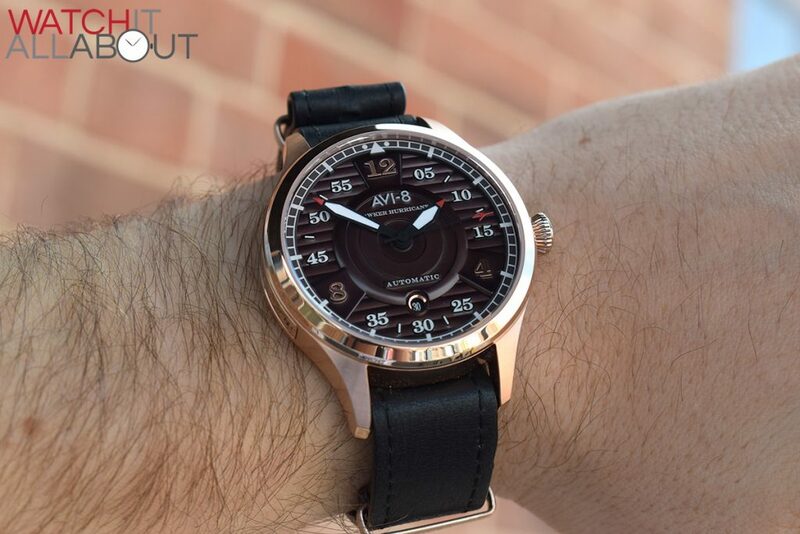 Priced at £340, it’s acceptable for an affordable automatic watch. No doubt in time it’ll be available elsewhere like Amazon for less, but in the meantime enjoy 20% off using code WIAB making it £272. 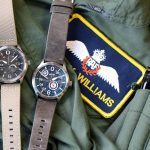 The primary purpose of the watch is to recognise the planes fought in the Battle of Britain – the first battle that was completely fought in the air, between the RAF and the Nazi airforce. 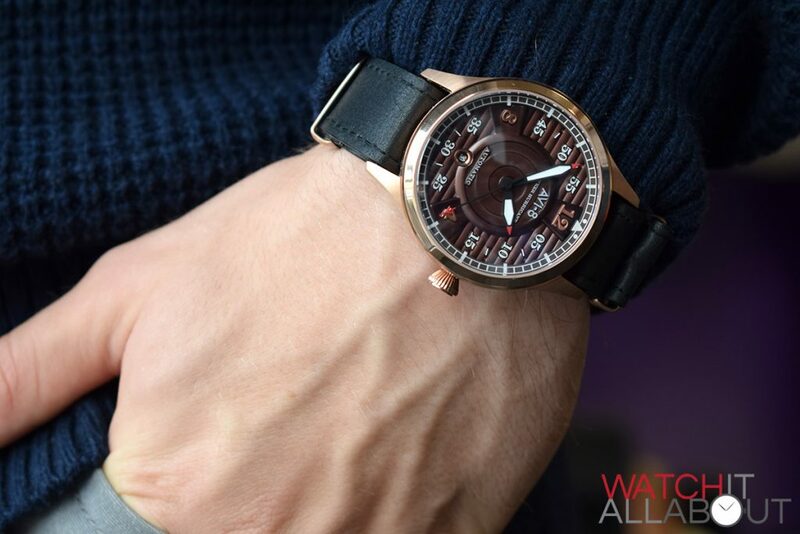 1963 planes were involved, so Avi-8 have made 1963. 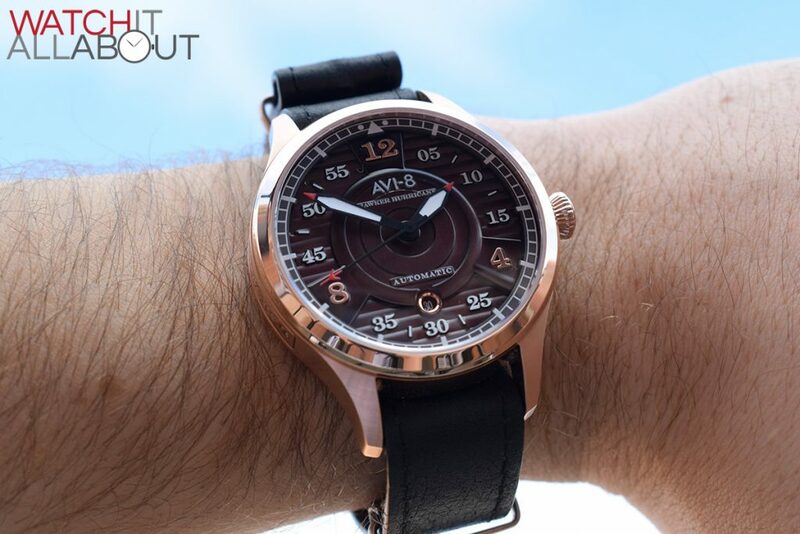 Check out Avi-8’s official statement for the release of this watch here. 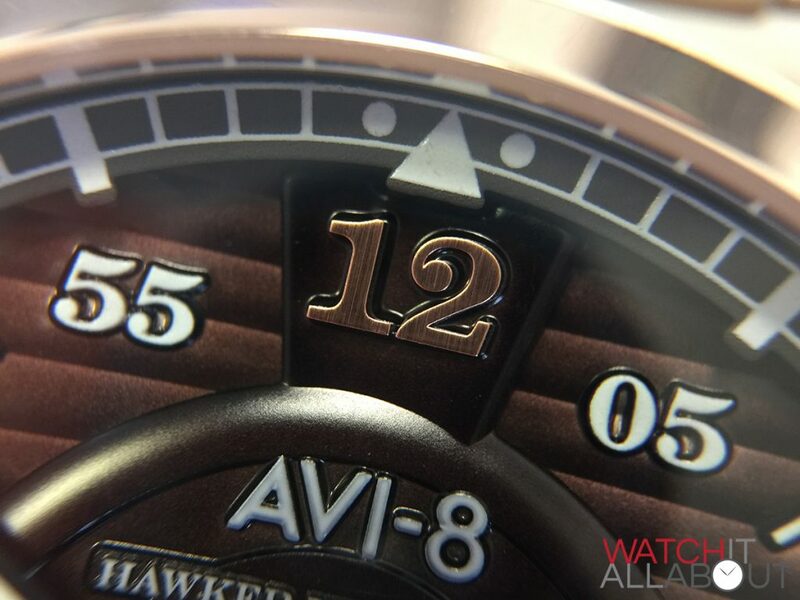 The first thing I notice is how the finishing on this watch is much better than any other Avi-8 I’ve seen. 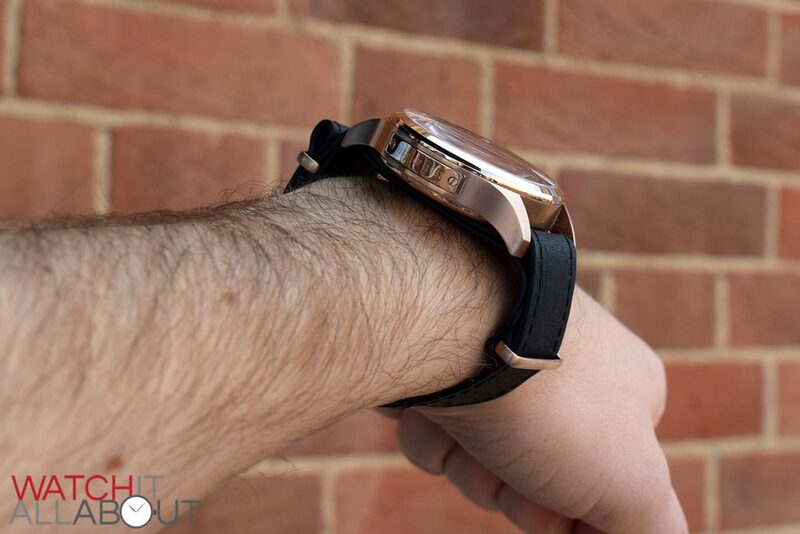 It’s also on the large side, with a 43mm diameter and the leather NATO strap forcing it to sit higher off the wrist. 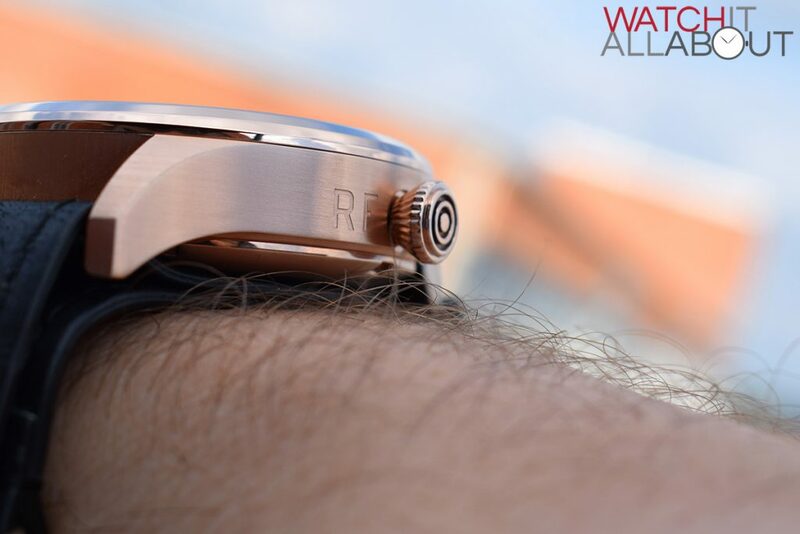 The highly polished bezel generates quite the impression, whilst the rest of the case is mainly brushed. 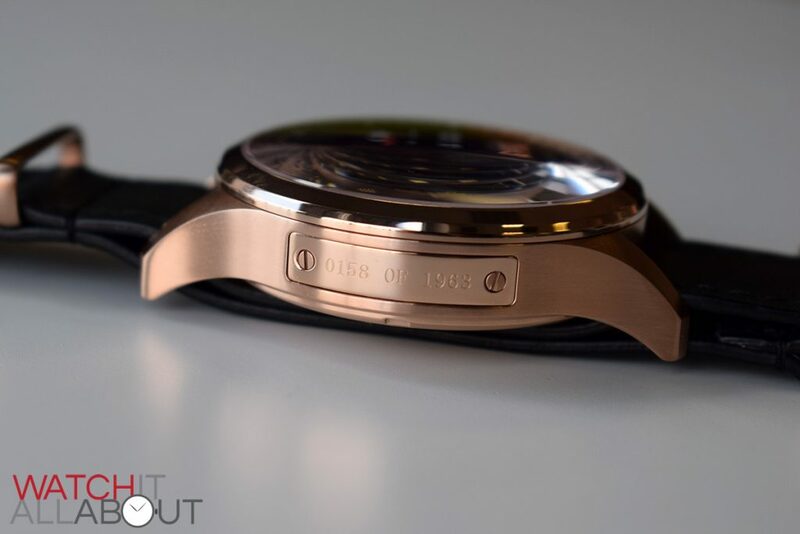 We have a polished ring around the very outside edge of the caseback and a polished plaque on side. The plaque is very nicely done, with what look like real screws (sometimes you see fake screws on things like these). The engraving is neat for the size and has the unique serial number on. 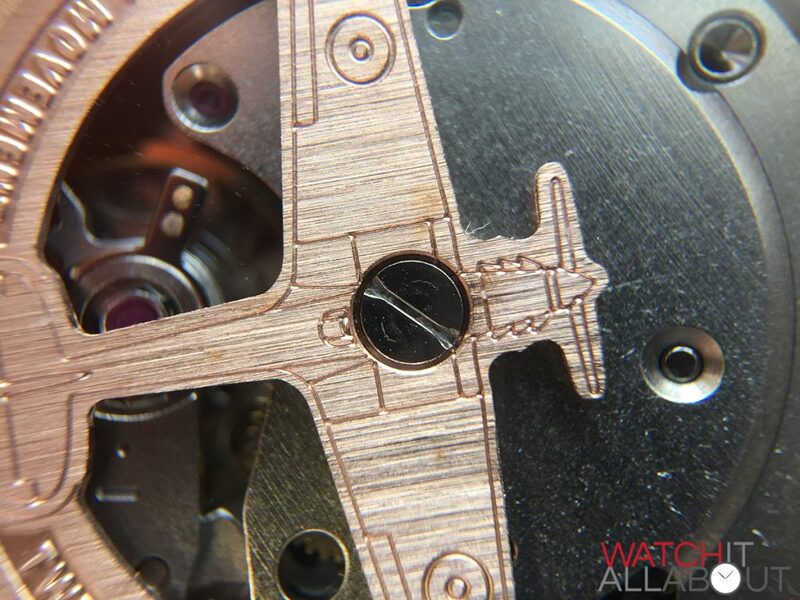 It’s set into the case, and this is one of the impressive touches that has impressed me. The push-pull crown is also a great feature. 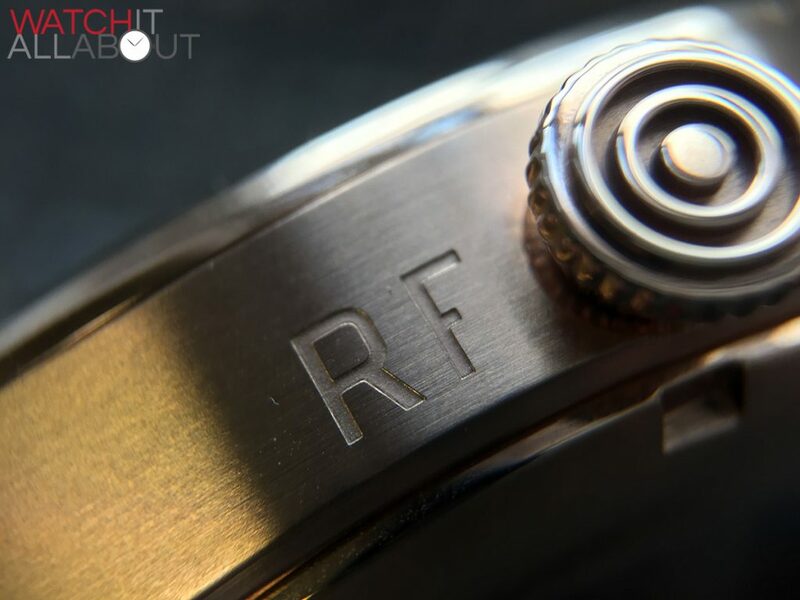 The extremely deep engraving on the end is of the RAF roundel – this and the markings either side of the crown on the case is designed to mimic the markings on side of a plane. 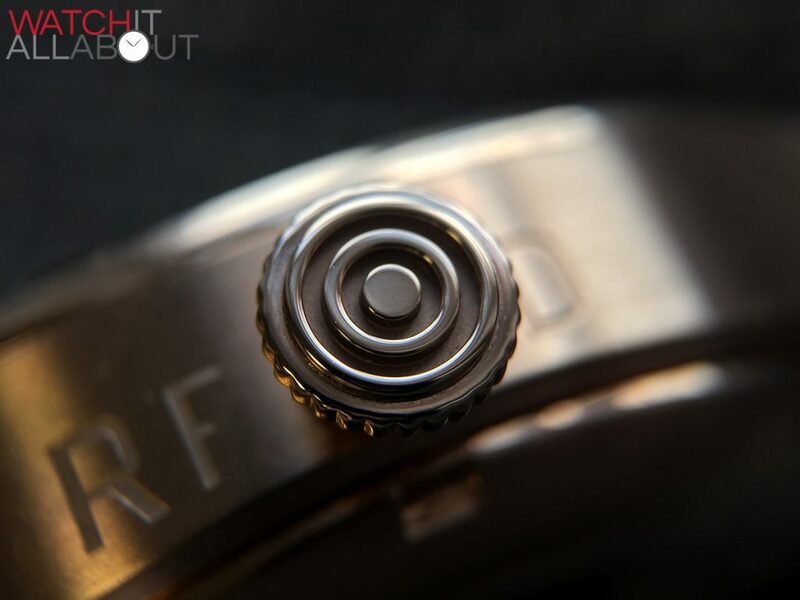 The end of the crown is polished and is machined with excellent precision. The two letters engraved to the left of the crown is the squadron code, and the letter to the right is the identifier of a specific plane within that squadron. I tracked down the squadron RF, and it was based in Poland, so this is a nice dedication to the reality of the battle. 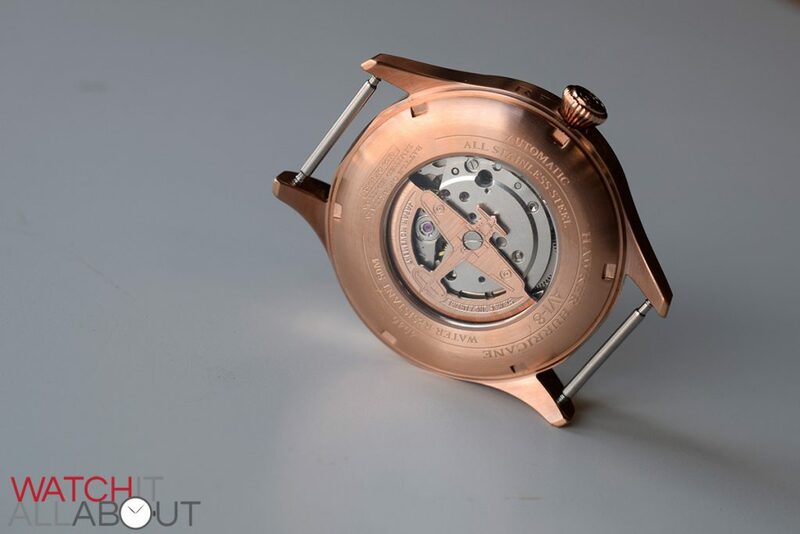 The screw-in caseback has an exhibition window to show off the movement and great plane rotor. 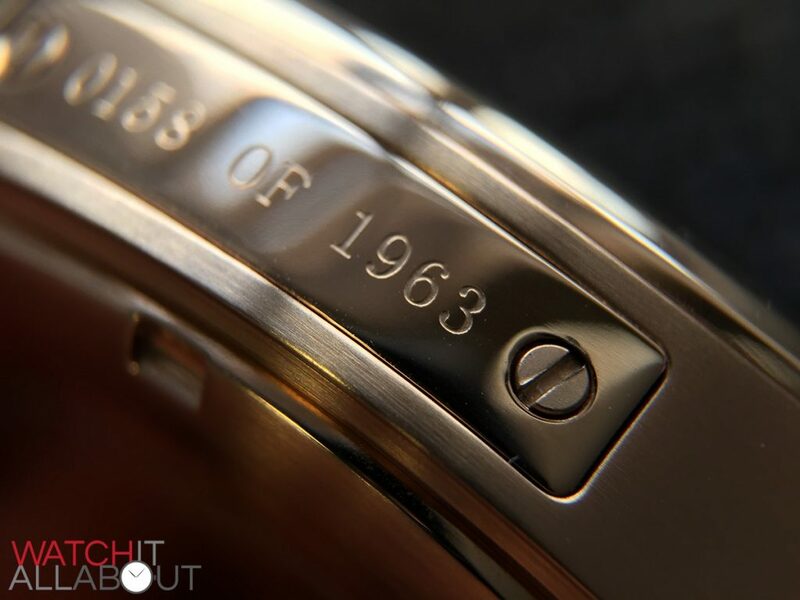 Various watch details are pleasantly engraved surrounding the window, which is all done to a high standard. 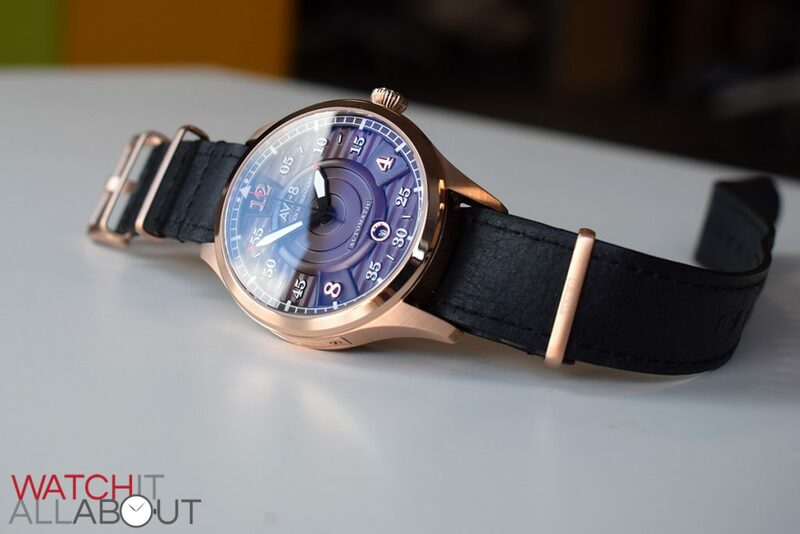 Sitting on top of the case is a single domed sapphire crystal. 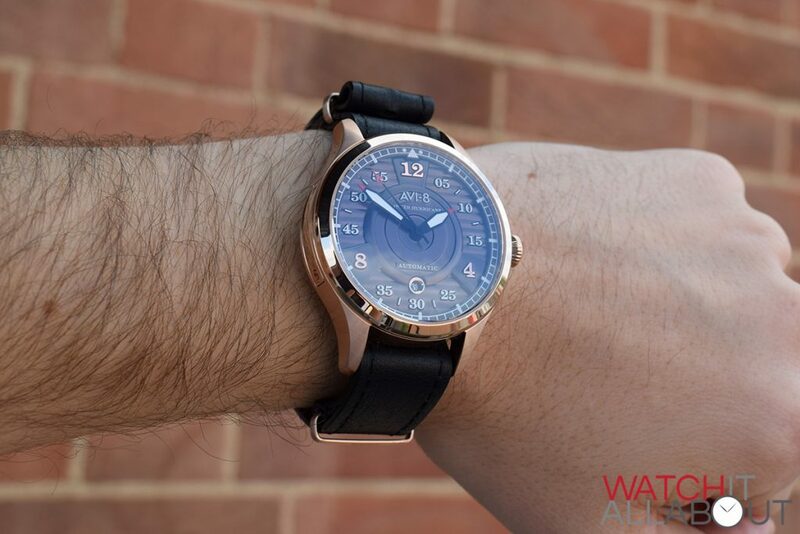 It has a layer of anti-reflecting coating on the underside which provides a blue flash when the light hits it. It’s not amazing at removing reflections, however, but does look nice. 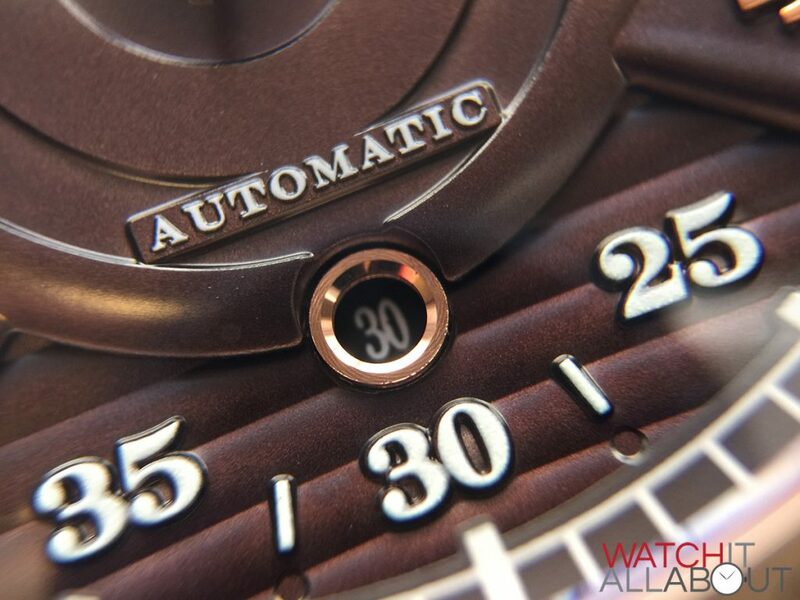 The dial is multilayered with quite a lot going on: it has plentiful depth and texture. 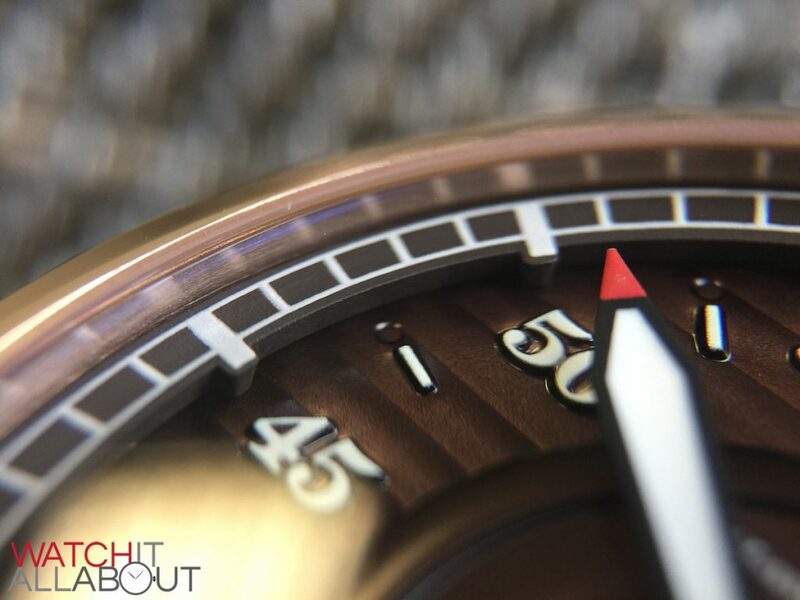 The main base of the dial has a ridged effect which is interesting and provides a variety of reflections. The top layer in the centre stretches out and encompasses 12, 4 and 8 in a propellor pattern and features a roundel in the centre. This is a nice subtle nod to the aviation theme. 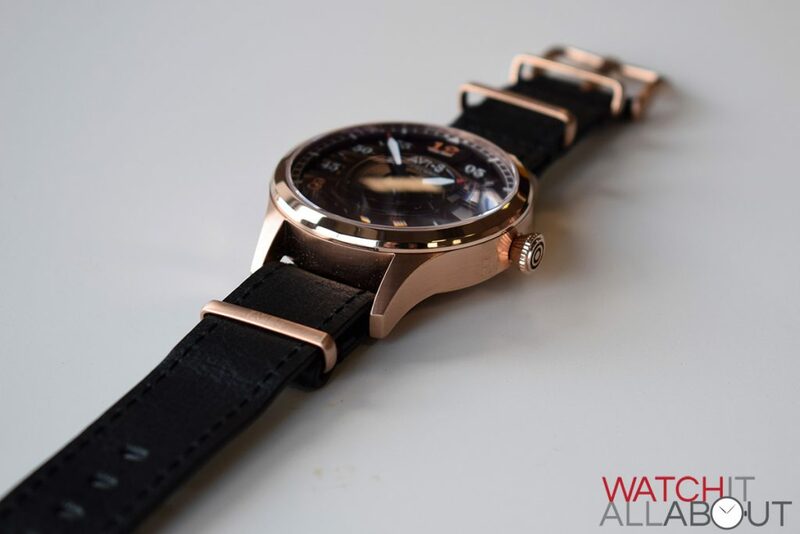 All of the printing is raised on the dial, and this is possibly the only downfall of the entire watch. 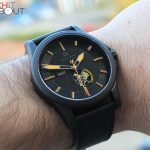 I would have liked a bit more definition on the logo and printed numerals – they don’t quite hit the standard of the rest of the watch. 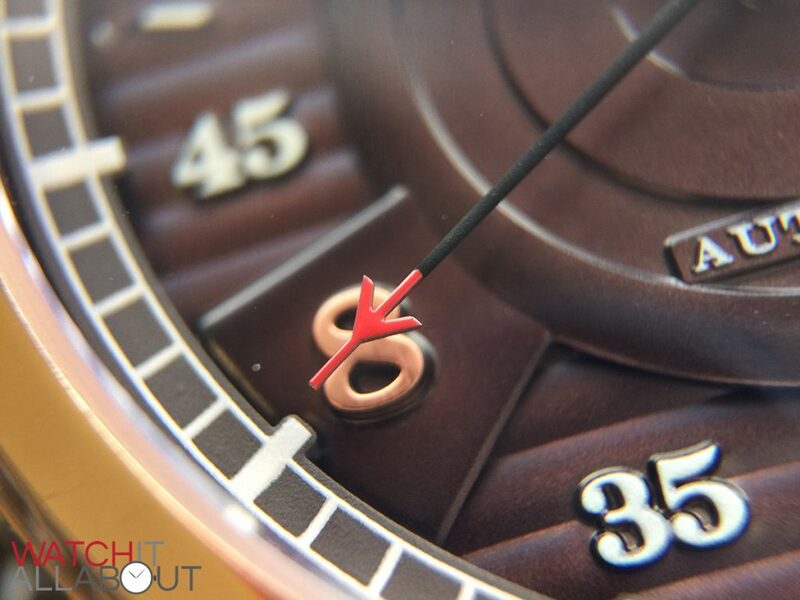 We do, however, have applied numerals at 12, 4 and 8 which are polished rose gold and well made. 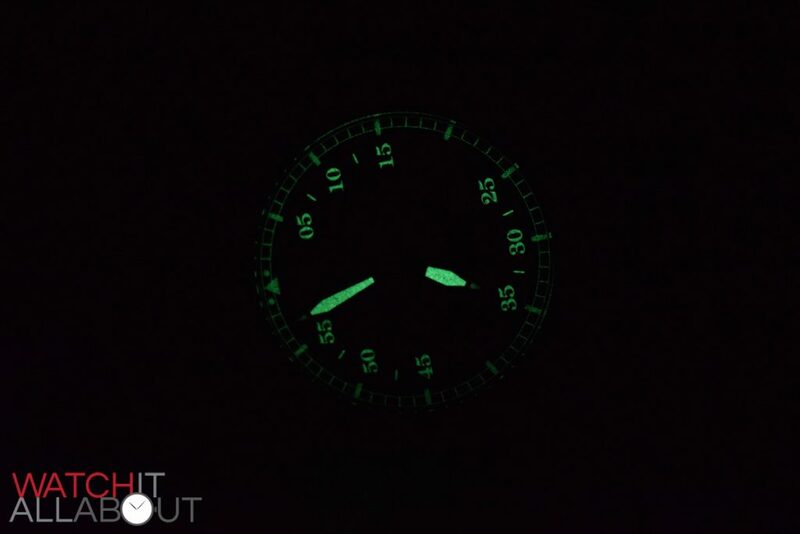 The hour and minute hands are thick swords, with a black border and filled with lume. They both have a subtle red tip which is more of an aesthetic touch rather than for legibility. The seconds hand is a black stick with a neat red plane on the end acting as a counterweight. The date window is positioned at 6 and features a lovely polished ring border that catches the light and is splendidly finished. 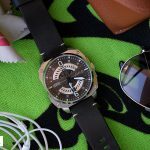 In addition to this, the date wheel is custom – firstly it’s matched in colour to the dial, and secondly a custom font has been used to match the rest of the numerals. The rehaut is raised off and above the dial, almost like a mezzanine. 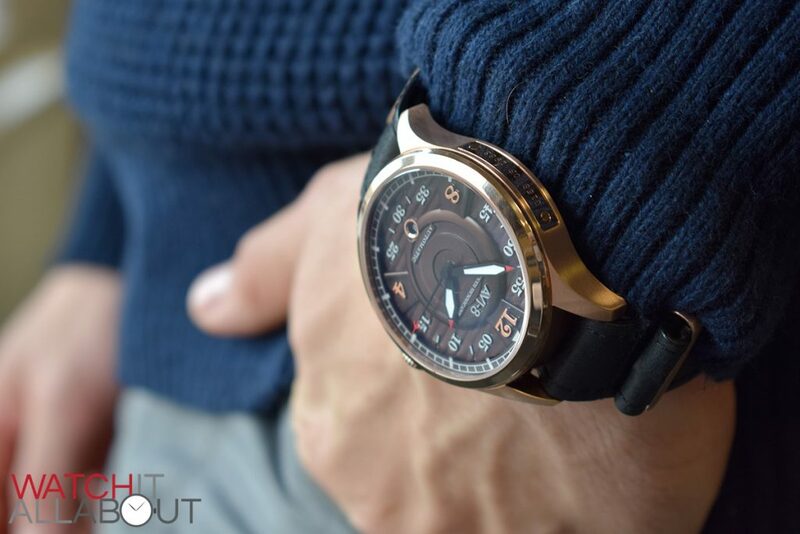 It has the minute track printed on and is a really interesting design feature of the dial that catches the eye. 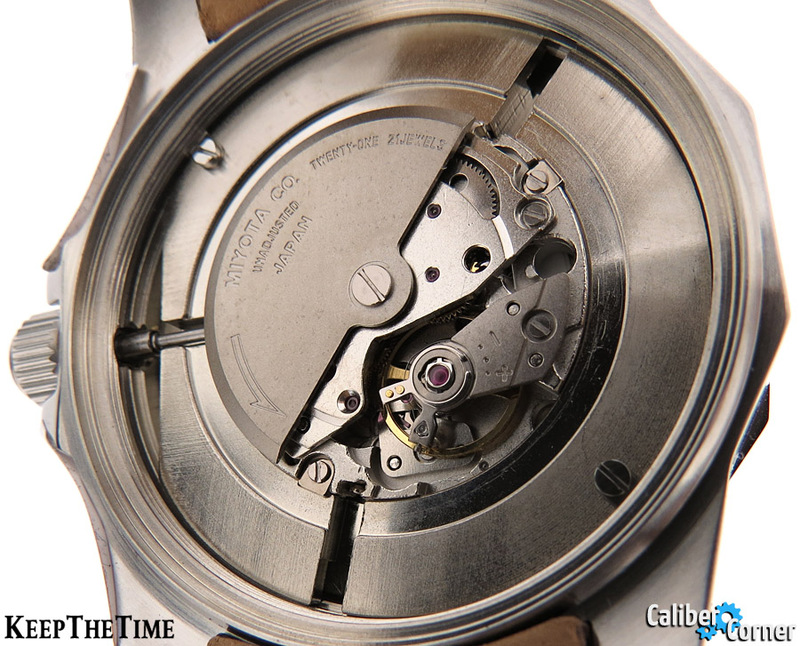 The movement used is the Miyota 8215, which doesn’t look too bad for a Miyota. Usually they look incredibly industrial and plain, but here the custom rotor really makes up for that. I’ve never seen this before – the rotor is the shape of a plane (funnily enough the Hawker Hurricane). It’s tastefully done, and is the kind of thing that pleasantly surprises you and makes you have a double take when you first see it. 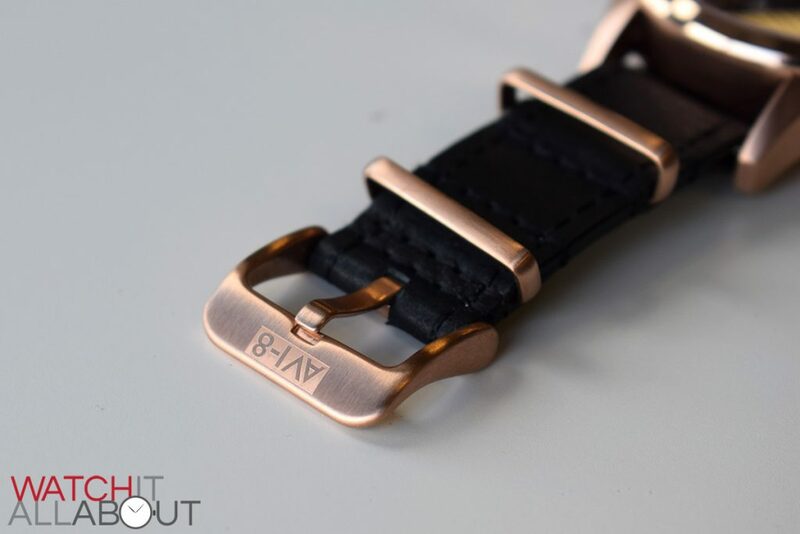 A great touch – it’s just a shame it’s hidden behind the bottom section of the NATO strap in normal circumstances. 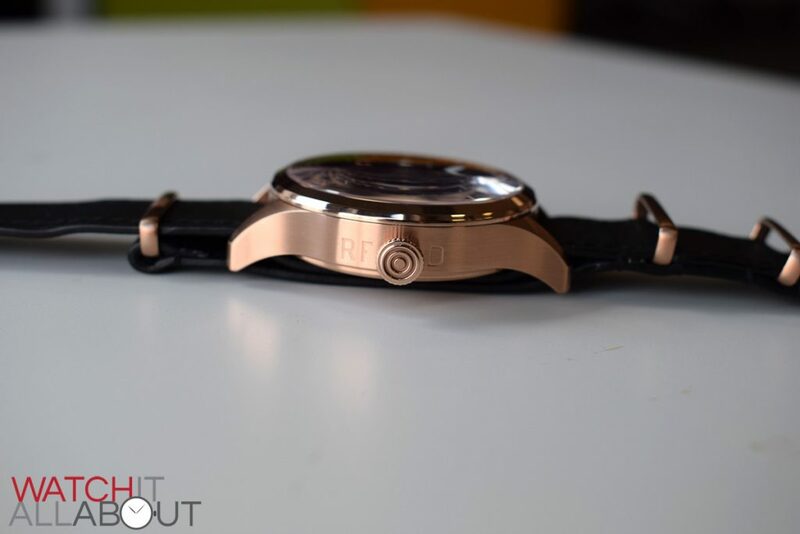 Other specs include a non-hacking seconds hand, low-beat running at 21.6k bph (6 ticks per second), 21 jewels, date, single direction (left) rotor winding, 40 hours power reserve, and accuracy of -20 / +40 seconds per day. Thanks to Caliber Corner for the picture below. All Miyotas have an excellent reputation for reliability so you’re in good hands here. 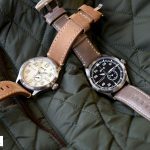 The Hawker Hurricane Battle of Britain comes with two NATO straps – one leather and one canvas. 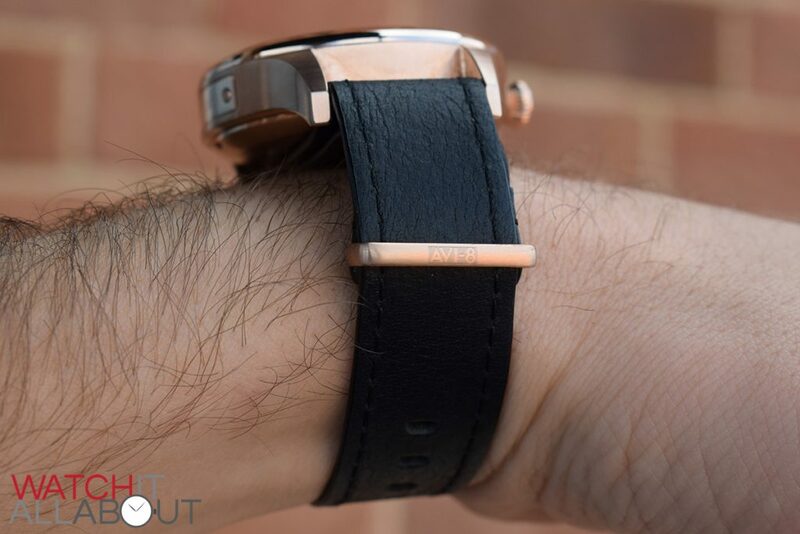 The canvas strap isn’t of the same quality as the leather, but it’s a nice extra option to have. 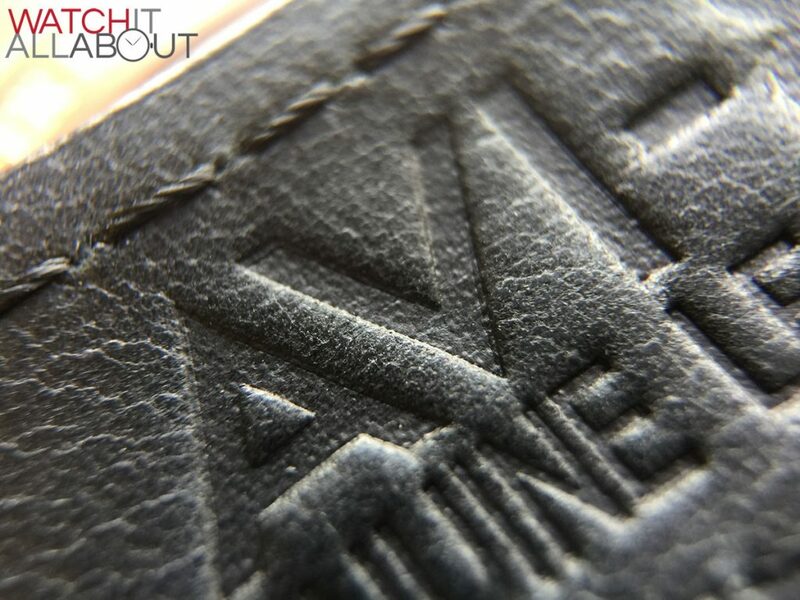 The leather is beautifully soft and incredibly supple – there is no need for any breaking in. 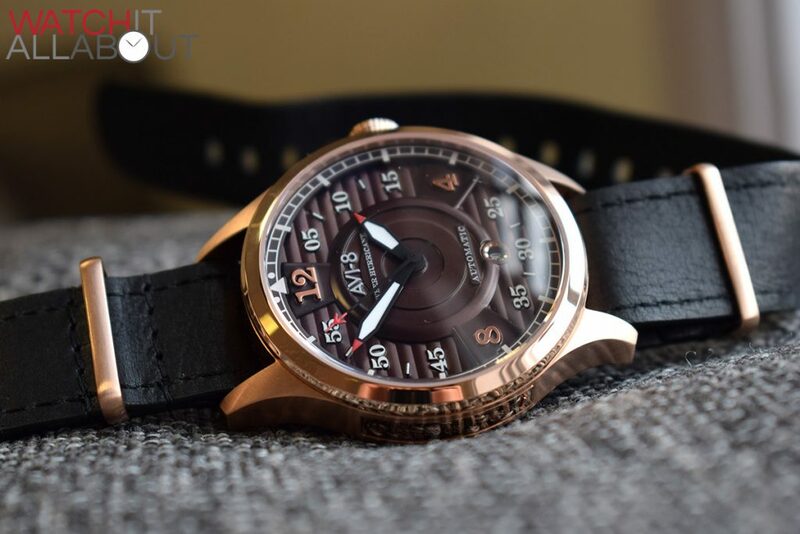 The colour is a very dark oaky brown which compliments the dial. 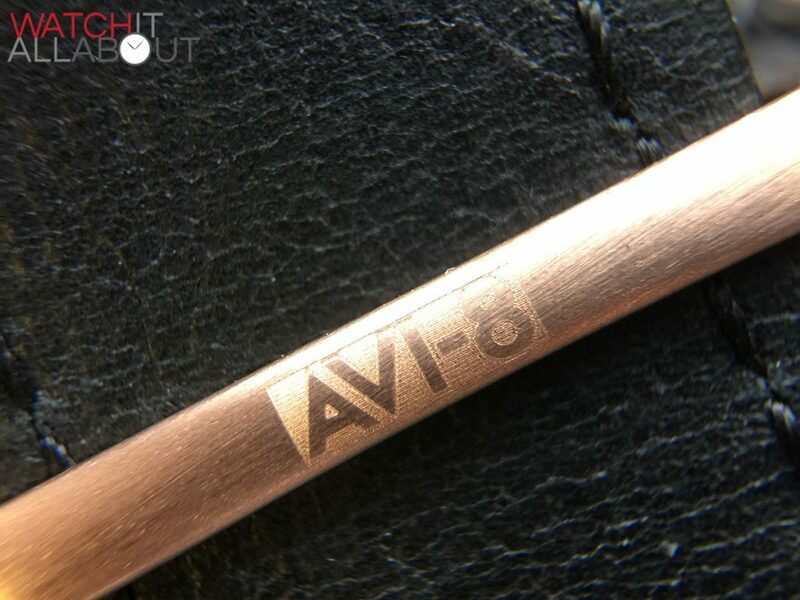 The rose gold hardware is all brushed and has the Avi-8 logo engraved – on both the buckle and the ring on the long length which is a nice touch. 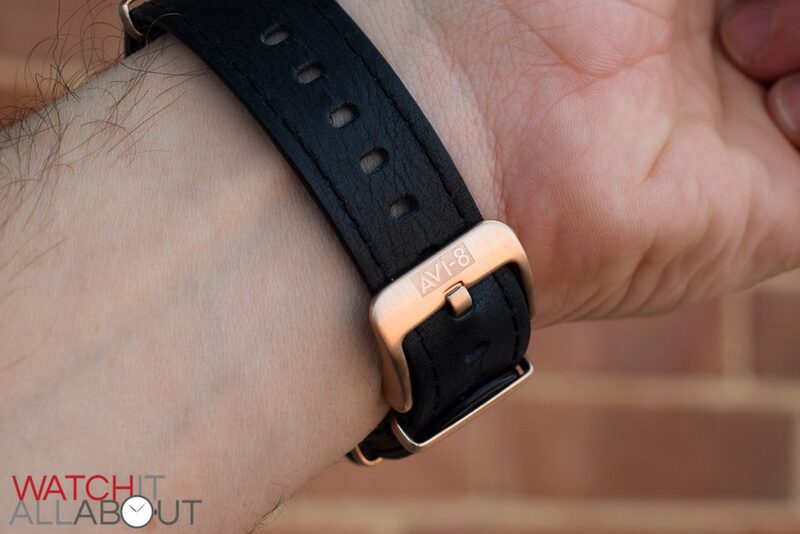 The NATO strap isn’t quite the same level. 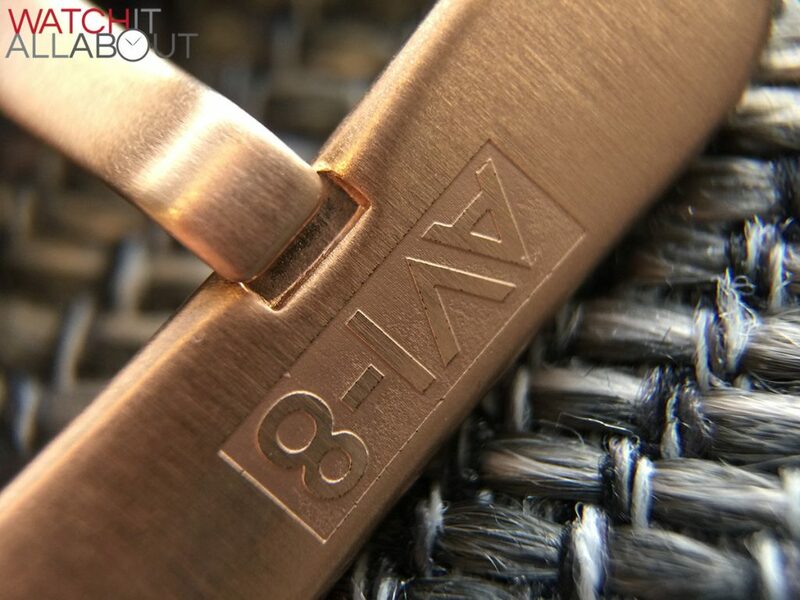 The hardware isn’t as good (it doesn’t have the same engraving). The canvas is comfortable enough but not finished as well – it’s a bit rough around the edges. 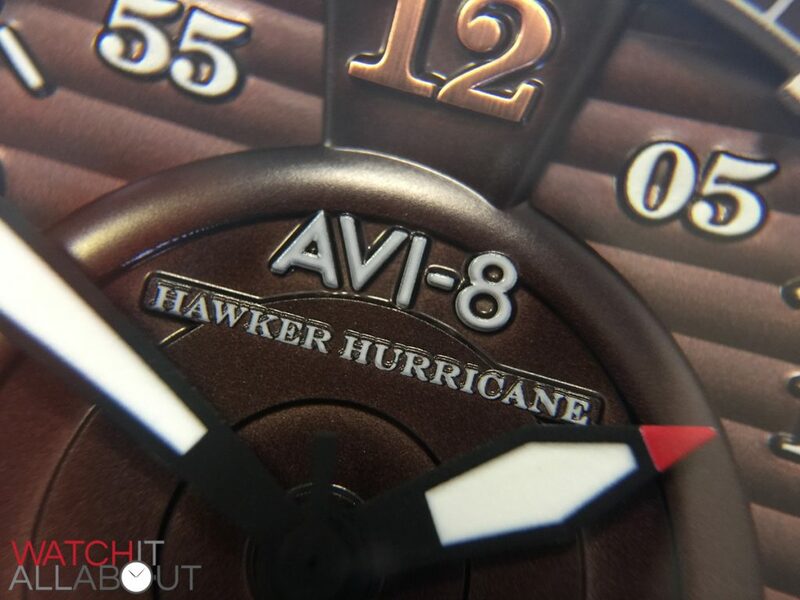 As I’ve mentioned before, this is the tidiest Avi-8 I’ve come across yet. With the 20% off using code WIAB, it’s a great purchase at £272 – even more so if you feel passionately about this topic. 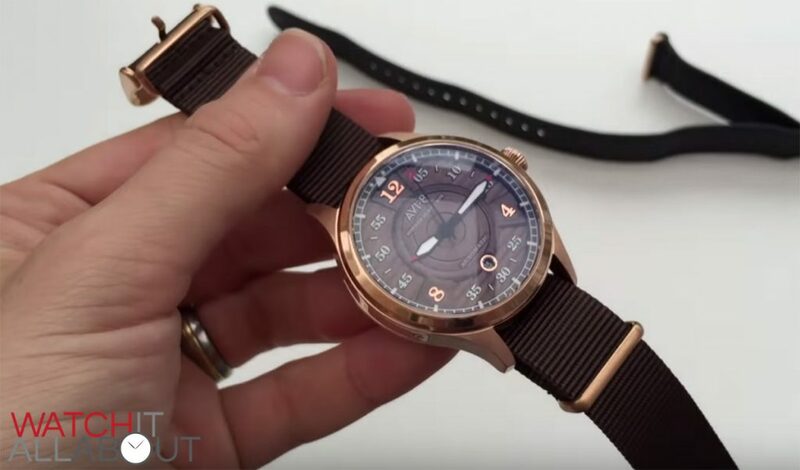 Even if you don’t have any concerns with planes or the Battle of Britain, it’s still a very nice watch that everyone can appreciate. 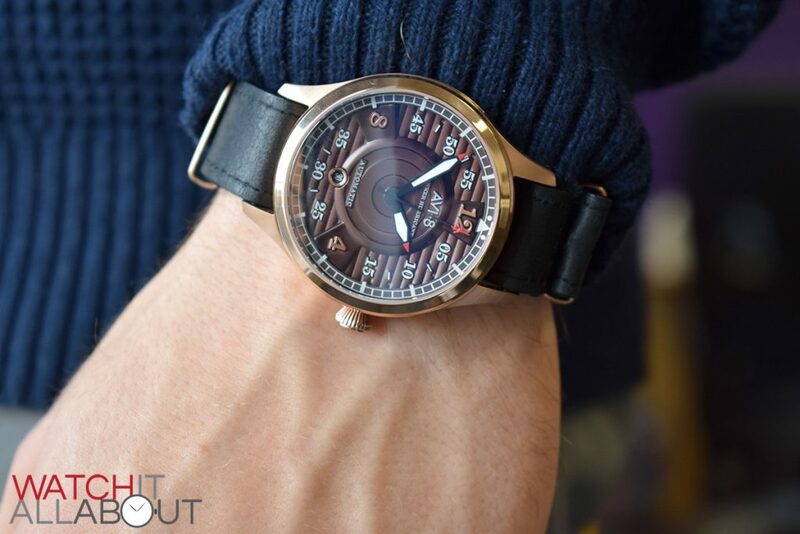 It’s the little things that make the Avi-8 Hawker Hurricane Battle of Britain stand out – the plaque, the crown with the squadron registration, the plane rotor on the movement, plus the general fit and finish. 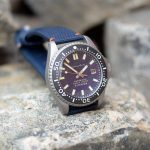 The only negative is the dial printing could be a bit more refined. 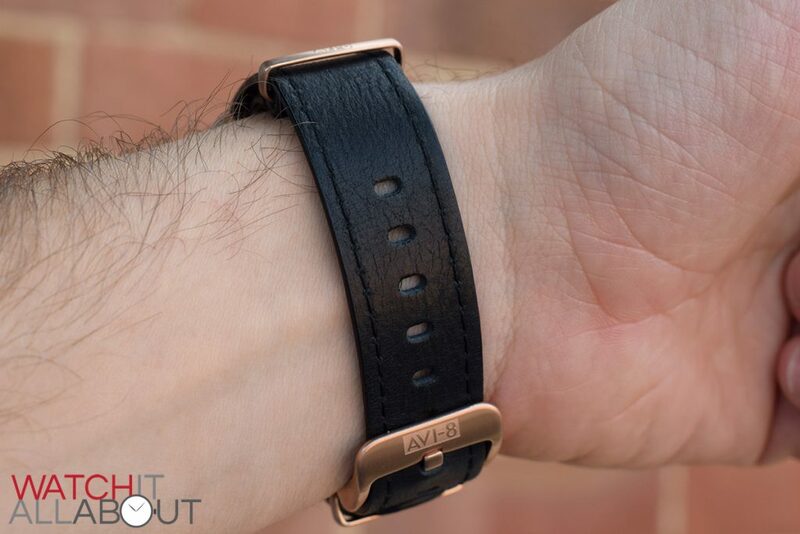 The watch certainly makes an impression – and I’m happy to say that it’s the nicest Avi-8 I’ve met to date.